Jassart’s presence does not go unnoticed by Antoine on Chapter 10, Page 14. His previous interactions with Jassart were not exactly the best. That’s okay. 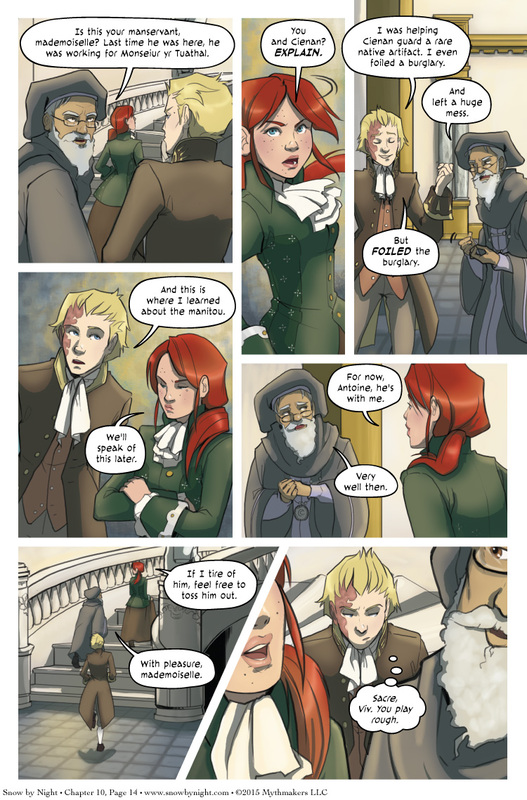 Vivienne has a solution that mollifies the old sage. Julie gave me a beautiful panel on the next page that looks like a cut scene. I couldn’t resist. To see for yourself, please vote for Snow by Night on Top Web Comics. I’m planning out the Kickstarter campaign for Volume 2. A lot of the prep work is done. I’m typing up the description for the campaign page as well as all the rewards. I’m hoping to have it start around the end of the month or early March. The fact that she plays rough is why I like Vivi so well. I think Jassart is figuring out he’s a little out of his league dealing with her. She’s not afraid to throw him out of the museum just ’cause she wants to. He can’t intimidate her nearly as well as his other peers (coughBlaisecough). Viv has power. She’s an important and influential figure locally, and she knows how to use that to her advantage. She knows, too, when someone is trying to charm or otherwise manipulate her, which renders useless Jassart’s usual strategies for getting what he wants. Well, he DID leave a Big Mess last time…..